Get the Study Guide ebook for free when you purchase the The First Fifty Years of Relief Society hardcover or ebook edition. To get your free Study Guide ebook, add the hardcover book or ebook to your cart. Then add the Study Guide to your cart. When you check out, the promo code will be automatically applied on the Purchase page. *This promo is valid both on DeseretBook.com and in Deseret Book stores. 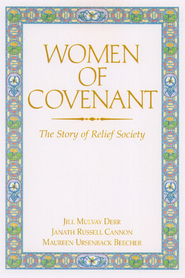 This collection of original documents explores the largely unknown nineteenth-century history of the Relief Society, the women's organization of The Church of Jesus Christ of Latter-day Saints. Founded in 1842 in Nauvoo, Illinois, the Relief Society was initially led by Emma Smith, wife of president Joseph Smith. The substantial minutes of the organization's proceedings from 1842 to 1844, published unabridged herein for the first time in print, document the women's priorities, contributions, and teachings. The Nauvoo Relief Society Minute Book also contains six sermons Joseph Smith delivered to the society, the only recorded words he directed exclusively to the women of the church. The organization was suspended from 1845 until the mid-1850s, when attempts were made to organize the Relief Society on a congregational level in some areas of Utah Territory after the emigration of the Latter-day Saints to the American West. A more general and permanent reorganization began in 1867, under the leadership of Eliza R. Snow, and the Relief Society's roles within the church structure and within women's lives expanded over the succeeding decades. The example of the Nauvoo Relief Society Minute Book helped create a record-keeping sensibility among Latter-day Saint women, who conscientiously created thousands of official and private records during the nineteenth century. The seventy-eight key documents in this collection include minutes of meetings, sermons by both women and men, annual reports from local Relief Societies, newspaper articles and editorials, political petitions and speeches, poetry, letters, journal entries, and reminiscences. They were produced not only near church headquarters but in far-flung settlements in the Mountain West and in areas as remote as Hawaii and England. These records from the first fifty years of Relief Society give insight not only into the spiritual and ecclesiastical dimensions of Latter-day Saint women's lives but also into their political, temporal, and social pursuits. Relief Society women cared for their families and the poor. They manufactured and sold goods, worked as midwives and doctors, gave healing blessings, appointed and set apart Relief Society officers, stored grain, built assembly halls, fought for woman suffrage, founded a hospital, defended the practice of plural marriage, and started the church organizations for children and young women. Prominent in the documents are the towering figures of Mormon women's history from this period—Emma Smith, Eliza R. Snow, Sarah M. Kimball, Mary Isabella Horne, Emmeline B. Wells, Zina D. H. Young, and many others. In addition, some two thousand lesser-known Latter-day Saints appear in these records. Each document has been meticulously transcribed and is placed in historical context with an introduction and annotation. Taken together, the accounts featured here allow readers to study this founding period in Latter-day Saint women's history and to situate it within broader themes in nineteenth-century American religious history. Size: 7" x 10", 767 pages. Jill Mulvay Derr is a retired senior research historian for the Church History Department, The Church of Jesus Christ of Latter-day Saints. Carol Cornwall Madsen is a professor emerita of history at Brigham Young University. Matthew J. Grow is Director of Publications at the Church History Department of The Church of Jesus Christ of Latter-day Saints and a general editor of the Joseph Smith Papers. He leads a team of forty historians, editors, and web specialists creating historical publications for academic and popular audiences. Grow was previously an assistant professor of history and director of the Center for Communal Studies at the University of Southern Indiana. He has received the Best Book Award from the Mormon History Association (twice) and the Evans Biography Award from the Mountain West Center at Utah State University. He received his PhD in American history from the University of Notre Dame in 2006. I'm not what you would call a "history buff" but this book I found delightful. It's a peek into the early Relief Society meetings and minutes. I love the photographs of the meeting minutes, some at the hand of Eliza Snow. Anyone that thinks Mormon women in our history were "wilting flowers" needs to get their hands on this book. This book shows that Relief Society sisters in our history were strong, smart, industrious, and deeply spiritual. I've recommended this book to several of my friends, many who have served in Relief Society for many years. We have such a rich history!